This year the world has seen its fair share (or more) of natural disasters. Amidst reports of chaos and disruption, I began to think about how lucky I am not live in and of the areas affected by them. 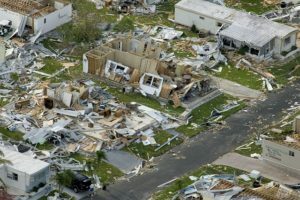 People have lost their homes from Hurricane Irma, wildfires and floods. The financial toll it will take on them as well as businesses and the government is going to be enormous. How will people recover financially from such devastation? Or better yet, is there a way you can protect your finances during a natural disaster? Here are a few things I thought of that might be able to help. Hopefully people affected by natural disasters have important documents stored securely. In the past, that may have meant locking it up in a safe in your home or at a bank. Today it means something entirely different. In fact, one of the best ways to store valuable information now is to upload it electronically. If you want a copy too, put it on a jump drive and keep it with you. Uploading your documents to a cloud server would allow you to have access from any device in any location following a natural disaster. It could even mean the difference between recovering financially and plunging into bankruptcy. Bankruptcy is a confusing proceeding. If you will be filing for bankruptcy soon, here’s how to file. Taking photo documentation of the damage done to your home, cars, and other possessions is important. You may have to prove what has happened in order to file a claim and collect on it. Check your coverage with your agent or agents by calling them right away. The sooner you call, the quicker they can start a claim for you. You will get money to replace possessions you lost faster by calling faster. Calling your insurance agent probably seems obvious to most of us. But you would be surprised at the number of people who don’t call and get a claim started. Some assume it will be started automatically. Others may simply not know they need to call their agent and report the damage. Give them copies of the documentation you took but keep a copy for yourself too. This protects you in case your insurer loses track of your claim or the information you provided. If that happens and it was your only copy, you could be out of luck. Don’t stop with calling your insurance agent. You should also call those to whom you owe money. If records and bills are unavailable this may be a difficult process. However, your creditors will most likely be willing to provide you with additional copies of invoices, bills, and statements. It is in their best interest to cooperate with you so they can get paid faster. But another reason to call them is because they need to know your payments may be delayed. Ask them to please give you some time to get payments to them as you have the funds available. You may be able to avoid bankruptcy or bad credit by making a few phone calls. Record or document all conversations you have about bills and insurance claims. When you keep good records you will be more likely to settle disputes and resolve financial issues satisfactorily. If for any reason your bank, insurance agent, or other professional fails to follow through on their actions your documentation can be important. Now is the time to access your emergency fund, assuming you have one set up. You may need the funds you have set aside to provide for the needs of yourself and your family. Contact your bank to get a few hundred dollars in cash for necessities and get replacement debit cards if needed. It is important to protect your finances during a natural disaster. Doing so could make the difference between financial recovery and ending up in the poorhouse. Have you had to face a natural disaster? If so, how did you cope financially?